What is your ‘problem’ area? Is it your forehead? Or maybe your jawline, or even your cheeks? For me, it used to be my chin and jawline, and also on my temples where I’d break out. I can say from experience that breaking out is gosh-darn embarrassing, especially because there is only so much makeup that can cover it up, and let’s face it…in your own head one tiny zit feels like the size of a sky scraper. I did a quick Periscope (add me @mandyking_HEAL) last weekend talking about skin, but thought I’d go into some more detail today, because skin problems like acne, eczema and psoriasis are very common complaints I help my clients with. A traditional way of dealing with acne is often with medication, sometimes with strong and dangerous ones like Accutane, which have horrific side effects. 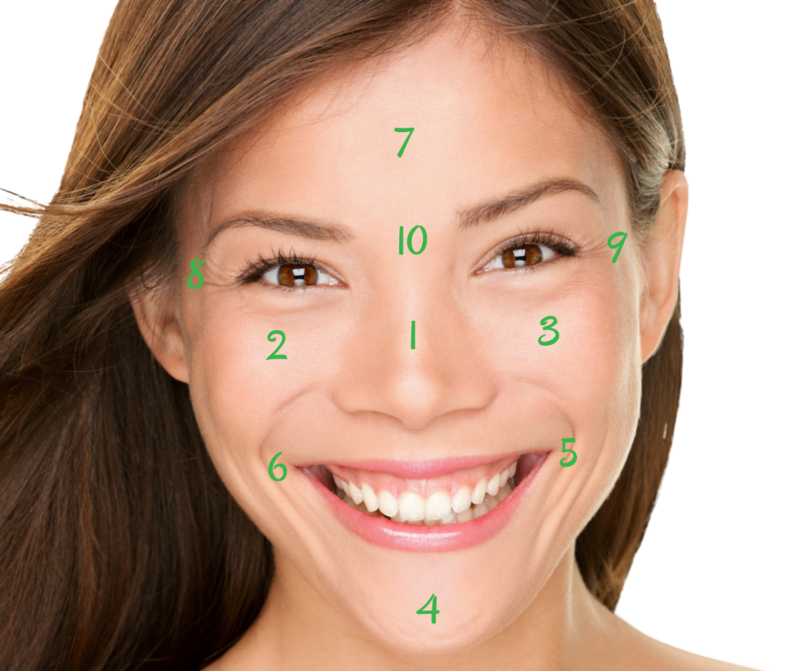 Something I like to do with my clients is called Face Mapping, which is actually a theory from Traditional Chinese Medicine that has been around for thousands of years. The premise is that the most common location for your acne provides an explanation of what the root cause might be. Adopt an anti-inflammatory diet that is high in Omega 3s, like flax, salmon and hemp hearts, and low in processed Omega 6 intake, like sunflower, canola, soybean and safflower oils. Garlic and Vitamin C are two incredibly effective natural solutions to high blood pressure. The garlic has to be raw. Mince once clove of raw garlic and have it with 1 tsp of raw honey, mixed together. The honey will offset some of the garlic flavour – and don’t do this on an empty stomach. If you have allergies or asthma, it may be worth working on an auto-immune protocol as your immune system is in overdrive and you may need to reduce inflammation in the body. Step one is usually repairing the gut. Many clients who come to me with asthma have a number of other autoimmune conditions that improve when we do a gut-healing protocol and focus on more of a paleo style diet. Ladies, I’ve been writing a lot about hormones lately. Hormonal acne is often a sign that your androgens (like testosterone) are higher than they should be. Along with hormonal acne can come PCOS (polycystic ovarian syndrome), the number one cause that women of child bearing age experience infertility. The first steps in fixing hormonal acne would be to manage your blood sugar by removing refined carbohydrates and increasing your clean protein intake and also managing your stress. Similar to the forehead, breakouts right on the corners of the mouth can often be a sign of intestinal difficulties or digestive problems. Healing the digestive tract is super important, and one of the best nutrients for healing the intestines is L Glutamine powder. You can get my favourite one that I use with my clients here. If you experience bloating, gas, diarrhea or constipation, you might also experience the dreaded forehead pimples. One very quick & easy thing to start you on the right track is your water intake. Are you consuming 1.5-2L a day (or more if exercising and drinking coffee)? Digestion is my jam, and one of my favourite things is to help clients with. Often, women come to me who wake up with a flat stomach and end up feeling 5 months pregnant every afternoon (though they are definitely not). If that’s you, or you’re just not even having a bowel movement every day, please get in touch because there’s so many little things we can do to help fix that! This includes dark circles under your eyes, which can be alleviated by drinking more water. Often the kidneys are under pressure from simply experiencing mild dehydration. I like to call the liver the unforgotten organ because we don’t often hear much about it, yet a sluggish liver can make it impossible to lose weight, can cause your hormones to be out of balance and even be the root cause of skin conditions too! Click here to read a blog post all about the liver.